The Frecon family has had a storefront in Boyertown since 1952. Richard Frecon and his family settled in the area in 1944 and began planting fruit—apples, peaches and nectarines. After outgrowing their roadside farmstand, they converted an old restaurant into a permanent retail location where they could sell their goods. 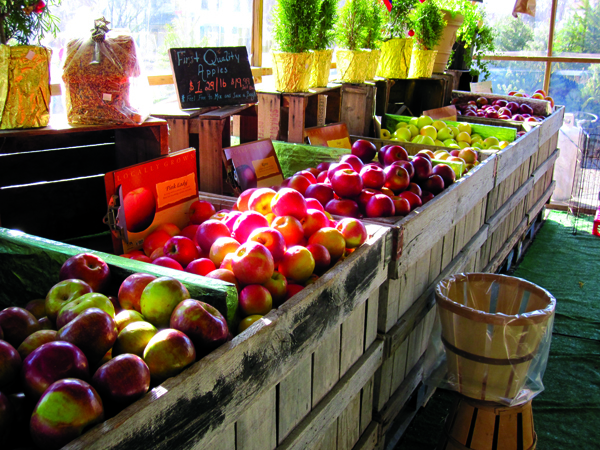 Richard’s son Henry and his wife Torrie took over in 1969, eventually expanding the retail operation to include produce from local farms and specialty items from regional natural foods producers alongside their fruit and fresh apple cider. Through PASA, they have also teamed up with local dairies doing artisanal cheese and glass-jarred milk, and livestock farmers raising hormone-free, grass-fed meat. They also carry free-range turkeys during the holidays. Just a few minutes up the road from the retail store are the orchards. Rows of trees stretch up a tremendous hill. From the top, you can see the neighboring farms and the expanse of the valley. There is something spectacular about an orchard in winter—rows of gnarled trees mustering their energies for a spring explosion. They are a sea of promise. In the storerooms, the fall’s harvest lies nestled in huge wood crates bearing the “Frecon” stamp. So many apples! Gala, Granny Smith, Honey Crisp—the list goes on.